Won Travers S. [G1], Haskell Invitational H. [G1], N.Y.R.A. 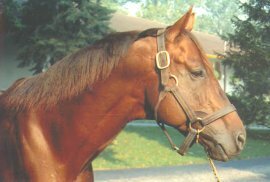 Mile H., Fountain Of Youth S. [G2], Lafayette S.
1987 Eclipse Champion Two-Year-Old Male. Stands at Shizunai Stallion Station in Japan.